The annual Group North Historical Wargames Society Open Day is running on October 30th this year. Come and join us to see some of the fantastic terrain and demonstration games being played. We have traders selling MDF terrain kits, Military Hobbies is joining us and the Bring and Buy table will be in full swing. The event is running from 10am to 4pm at the A.E. Martin Hall at the entrance to the Penfield Sporting Association off Woomera Ave at Penfield. There will be door prizes for turning up and voting in our miniature judging competition. Food will be available from the venue. A sample of games being players are Frostgrave, Kings of War, Flames of War, Tanks, X-Wing and Dystopian Wars. More details as we finalise our displays. Our bring and buy table is always popular and our terms and conditions for the Bring and Buy commission sales are straightforward. Items for sale need to be packed for display and clearly labelled with three letters (e.g. your initials) and an item number, for example SBG001, SBG002, along with the price. Each item�s details are to be recorded on the form provided. We reserve the right not to accept forms other than this design. When pricing items, it is preferable to use whole dollars only. This makes it easier to sort out the commission later. The Group North stall reserves the right not to accept any item we deem inappropriate. If your goods are sold, we retain a commission of 10% of the sale price. All goods/monies must be collected before closing at 4:30 pm on the day (also see below). Early payouts at the discretion of staff. As a general guide, payouts can be done anytime from around 2:30pm onwards. Unless prior arrangements have been made, uncollected goods and/or monies will be held by Group North. It will be the owner�s responsibility to contact Group North and arrange collection. Any disputes or claims of missing items MUST be made at time of pickup. It is your responsibility to check that you have collected all of your unsold items. While every effort is made, Group North takes no responsibility for loss or damage to goods while on display to the public during the course of the event. By lodging items for sale at the Bring and Buy you are acknowledging that you understand and accept these terms and conditions. The best time to bring in items for the commission sales is on the club meeting nights of Wednesday 26th or Friday 28th October. That way we know how much table space and shelf space we need for the stall. Items can also be brought in at the start of the open day on the 30th. It also ensures your items are on sale before you can even get out to the venue. Hope to see everyone come out and talk and enjoy gaming with us. Have you got a complete list of games that will be 'available' the day yet? Is Sam Mustafa's Blucher rule set getting a run? Just starting to put the list up. I don't think Blucher is being run this year but pretty much all of the historical players in the club have tried those rules. The Crimean War between the Russian Empire, from one side, and the Ottoman, British, and French Empires, and the Kingdom of Sardinia, on the other side, lasted from 1853 to 1856. It left long lasted legacy in politics, military affairs, technology, medicine, and culture. Among other things this war saw the first tactical use of railways and the electric telegraph, the first war photographs, and the first documented use of industrially made chemical ordnance (used by Royal Navy during bombardment of Odessa). The Battle of Petropavlovsk (5 September 1854) was one of many engagements of this war, but it was one of the few in which the Russian forces decisively defeated the Anglo-French Allies. Petropavlovsk was a Russian outpost and port on Kamchatka peninsula (Northern Pacific). The garrison included 1013 able men (regular infantry, gunners, sailors, policemen, volunteers, and native Kamchadal hunters) and had 98 guns (including those on Avrora and Dvina, the two Russian warships). The Allied squadron consisted of six ships, totalling 212 guns and 2200 officers, sailors and marines. The Allies attempted two landings, 1 and 5 September 1854 (or 31 August and 4 September by the Allied ship logs). The first landing was aborted at its height for some unclear reasons (the journal of Captain Parker, Royal Marines, indicates that the landing party was recalled to ships for lunch, believe it or not). The second landing, on much bigger scale, ended in a disastrous defeat of the Allies. The party of 700 French and British marines and sailors was crushed by a mere 290 Russians. Of those landed 52 were killed or missing and 163 were wounded in just three hours. The survivors were so badly shaken that the squadron departed as soon as they could bury the dead and repair damage to the ships. The Russian casualties were much smaller: 31 killed and 63 wounded. The action of 5 September is replayed using Warhammer English Civil War core rules with some modifications reflecting the mid-XIX century technology, local conditions, morale of the troops, and frictions between the Allies. FoG is an Army level game covering the ancient and medieval period from the rise of the earliest known armies through to the introduction of effective gunpowder weapons. FoG is designed to play a battle with 10 � 15 units (called Battlegroups) in a 3 � 4 hour game. Each Battlegroup is made up of a variable number of stands elements) usually between 4 � 8 elements and the Battlegroups are moved by commanders as independent units which remain as a single cohesive block for the game. These Battlegroups move as a unit but the combat system allows the shooting and melee combats to be fought by those stands exposed or in contact. 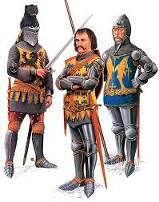 Battlegroups are rated by type (cavalry, heavy foot etc) training, protection level, weapons and morale. Time Scale � each turn is about 20 � 30 minutes of �real time�. Each heavy infantry stand = about 400 - 500 men. Each cavalry stand = 200 � 300 cavalry. The rules are designed to allow a battle to be fought on a standard 1.2 x 2.4 metre table with a reasonable number of figures but they still retain a good �feel� for ancient warfare at the commander�s level. The rules philosophy give a top-down feel and game roles are provided for the commander and his senior generals. At this level of battle modelled the rules also reflect the weapon, armour and fighting methods employed by each unit. The Armies for the demonstration are 25mm figures from a range of manufacturers including Old Glory 25s, Wargames Foundry and Essex UK. Thanks for the reply and updates! Nerdvana Games: An excellent range of exciting new games systems. The store will also be running a Guild Ball demonstration table. Jackal Designs: A laser cutting service providing an excellent range of terrain kits and trophy making. The store will also be running a Frostgrave demonstration table. 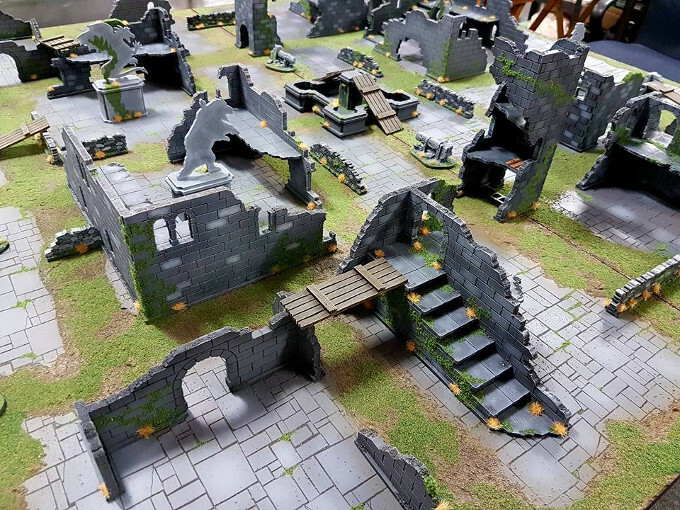 Scorched Earth: A laser cutting service with a speciality in 40K terrain kits. The store will also be running a Warhammer 40K demonstration table. Come along and support local businesses. If you can't find the item you're after on the second hand table these traders will be able to help you. Help the Rebel in their battles against the Galactic Empire, or serve your own interests in a band of Scum and Villainy. X-Wing is the number one miniatures games in the world that perfectly captures the feel of fighter ship engagements. Developed by Fantasy Flight Games and sold pretty much everywhere. We'll be running small introduction games but if you are keen for a full 100 point dog-fight turn up and we'll be able to play (or match you against someone else there on the day). Tanks: Panther vs Sherman is an easy-to-learn, quick play, small-scale game in which you take command of a tank platoon, seeking to destroy your opponent's tanks and secure victory. Tanks is a flexible game with lots of ways to create a finely-tuned army that fits your play style. In a half-hour, you can pick your tanks and crew, upgrade them to your specifications, defeat your enemy (or die trying), and be ready for the rematch! There will be a demonstration running on a custom built table, where you can learn all the fun a game that mixes a simplified X-Wing like rules with World of Tank like battles. A thousand years ago the necro-priests of Ophidia attempted to extend their realm westward into the realms of the elves. In a gentle valley in the Eastern Reaches southeast of Ileuthar a great battle was fought between the undead and an alliance of elves, salamanders and dwarfs. Both sides fought fiercely and without mercy for two days and nights until at last the undead were destroyed and driven back. On the third day the two armies faced each other across the valley knowing that the war was finished and retired to their lands. Later the elves built a watchtower on the western side of the valley while a mysterious dark tower grew out of the ground as if the stones flowed like liquid. Not completely trusting the elves to maintain watch the dwarfen merchant guild of Ileuthar built an outpost that could observe both towers. So it has remained until now. A powerful vampire has raised an army of undead to continue the march into the west. Realising the overdependence on undead was a major failing of the last attempt, he has raised powerful allies from the Ratkin and Orcs. If he can control this battlefield then his necromancers can raise the armies that perished a thousand years ago and complete the conquest of Elvenhome. This is a modified kill mission with the following special rules. The top of each tower can be occupied by a single war machine or hero that can fit! The terrain around the tower is difficult and the tower cannot �charged� i.e. no charge benefit for any unit type. The occupant of the tower has a 6+ save. No-one can occupy the top of the tower once the game commences. Control of the tower is worth 500 VPs. A unit (not hero of any type or war machine) must be touching the base with no enemy touching the base or in the tower. Kings of War is a mass battle fantasy wargame from Mantic Games. Armies drawn from 20 official lists covering a wide range of fantasy types including elves, undead, dwarfs and many more. Kings of war is a very tactical game with an emphasis on co-ordinated attacks and manoeuvre. It is a fun game to play and a 2000pt game can be easily completed within 2 hours or less. Games can be played with as little as 1000pts and any manufacturer�s models can be used that reasonably represent the units described in the army lists. Many gamers have played other systems such as Warhammer Fantasy Battles and those models can be used for Kings of War as well. Come chose a wizard to either search for treasure or hunt other wizards! Amidst the frozen ruins of an ancient city, wizards battle in the hopes of discovering the treasures of a fallen empire. In this fantasy skirmish wargame, each player takes on the role of a wizard from one of ten schools of magic, and builds his band of followers. The wizard's apprentice will usually accompany his master, and more than a dozen other henchman types are available for hire, from lowly thugs to heavily armoured knights and stealthy thieves. Wizards can expand their magical knowledge by unlocking ancient secrets and may learn up to 80 different spells. 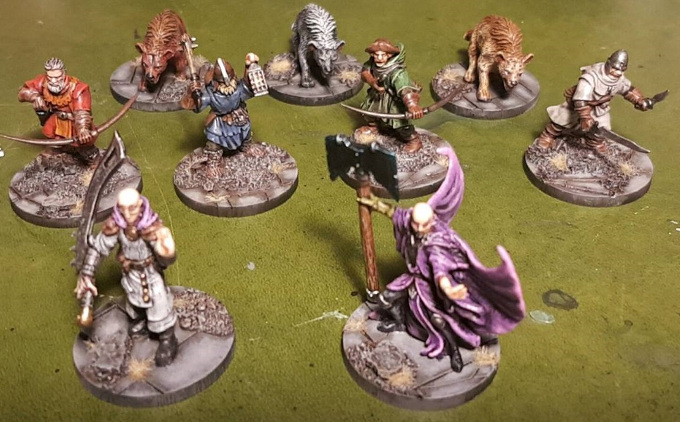 While individual games of Frostgrave are quick and can easily be played in an hour or two, it is by connecting them into an ongoing campaign that players will find the most enjoyment. The scenarios given in the book are merely the beginning of the limitless adventures that can be found amidst the ruins of the Frozen City. Thor, Thyra and Beast Claw have followed the Goblin forces driven by the Mountain Men into the city of Midkemia. They have waited for months to retrieve their tribes magic totems back from the Mother leading the Mountain Men and the chaos of the battle is the best chance to strike. But they have to be quick, the Mother plans to enact the magic ritual to summon a great beast of the Dark Realms to her service that will lay waste to the city and all around it. Captain Horace in the mean time is trying to drive back the Goblin attack. He has to hold the bridge and the gate house while reinforcements move in to position. If he can hold on long enough they will be able to contain the invaders. But the Goblins have made sure to bring in some strong allies. This game uses very simple mechanics; each model only has two values, Quality and Combat. The game uses a push your luck mechanic for how much you can use in a turn. Each model can roll 1, 2 or 3 dice to activate. Each die roll equal to or greater than the Quality equals an action but it two or more rolls fail your turn ends (after taking any actions generated). The game can swing back and forth depending on the quality of your troops and how much you need them to do in a round. Your turn ends after a failure to activate or when you have activated all of your models. Combat is based on opposed die rolls where each player adds their Combat score. The higher winner can normally push the loser around or knock them over. Really good results will kill the opponent outright and extreme results will force nearby friends of the slain model to run away. Combat is risky though as you may be killed while attacking someone else so you need to position friends to support your attacks. Ranged combat is less effective; this game is all about closing in with your opponent and taking them on in hand-to-hand combat. Archers may even run out of missiles. Magic is simple to represent with two effects, either a more accurate ranged attack or providing the ability to transfix the mightiest opponent to make an easy close combat kill. However magic comes at a price; you need to use more actions for more power and could force a turn-over. Additionally if your magic user fails 3 activations in a turn they have lost their magic for the rest of the game. On today. So many more things to see and do from that listed above. 10am to 4pm, with free entry and door prizes. We had a fantastic day at our Open Day. Here are some links to details of games played and photographs of the event.